• Scalar energy raises the vibratory frequency of anything placed within its field including the blood of your body and water of your cells. • Scalar influence promotes high cellular energy, enhances performance and enables the immune system to flush waste, your body’s ability to heal itself. • A Scalar field can create a twenty-fold stimulation of cell growth in immune system cells. • Scalar energy is capable of imprinting itself on your DNA. 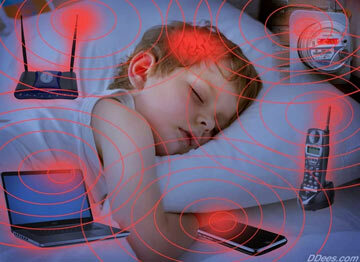 • EMF pollution is caused by electrical hertzian waves, ie cordless/cell phones, computers, microwaves, WiFi routers, etc. 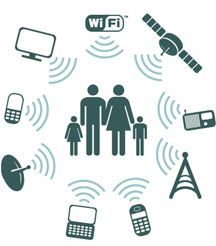 All electrical motors emit levels of EMF’s. • Hertzian waves are single waves which travel in a counter clockwise corkscrew rotation, a detriment to our body. • Scalar Waves have a pair of identical but opposing waves which carry information and travel in a clockwise rotation. • Our DNA rotates in a clockwise motion allowing Scalar energy a harmonious assimilation with our cells. • Scalar Waves positively influences immune and nervous systems independent of the beliefs of an individual. • Scalar devices deliver information to the body when worn. Remove the device and influence remains in those cells which were exposed to the energy field. • An imprinted device placed around consumable foods/liquids will transfer energy field frequencies to that product. This page will go a little deeper into the history of Scalar energy frequencies, how they differ from electromagnetic frequencies (EMF’s) and the potential Scalar offers our well being. Everything is energy and everything vibrates at different frequencies. Bio-Scalar energy is a unique form of energy that can be harnessed and directed into solid objects. You can use Scalar energy to raise the vibratory frequency of food, water and other liquids including the blood in your veins, the water in your cellular makeup and even create positive effects to your DNA. When used on living cells they become more vibrant, naturally energized, and more capable of absorbing nutrients and eliminating wastes and toxins. The tensor ring devices I create are infused through a Scalar Wave process where they become potentized with frequencies beneficial to our physical and spiritual well being. The higher the level of energy in your cells, the greater the ability of your cells to absorb nutrients, eliminate toxins and wastes and build healthy tissues, bones, organs, glands and nerves. High cellular energy greatly enhances the performance and effectiveness of your immune system and your body’s ability to heal itself. 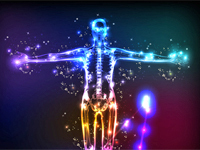 Everything, including our body, is made up of energy which vibrates at different frequencies. Everything has a vibrational frequency and all life is energy. Researchers have proven Scalar Energy can raise the vibratory frequency of living cells making them more naturally energized. This enables cells to flush waste from their system, even negative cellular memories by shifting the cellular polarity. As an analogy, similar to erasing a cassette tape to be reused as fresh again. Scalar Waves can also serve to neutralize chaotic incoming signals from man-made electromagnetic frequencies (EMF’s), the 50 – 60 cycle waves which are bombarding us from cell phones, cordless phones, computers, microwaves, WiFi routers and other electrical conveniences. All electrical motors including the one in your kitchen refrigerator emits high levels of EMF’s. Our negative thoughts affect our cells adversely. Employing Scalar Waves allows our cells to utilize their own innate wisdom for self-healing beyond our conscious input. Scalar Waves provide a zero-point or vacuum field of unlimited potential. Scalar fields have always existed subtly in the background of nature, now we are able to wisely use them for our benefit. Scalar Waves are regarded as a fifth-dimensional non-linear field where they travel faster than the speed of light and do not decay over time or distance. In the last few years scientists have confirmed that a scalar field can create a twenty-fold stimulation of cell growth in human immune system cells. Scalar Waves increase the energy covalent level of every single hydrogen atom in the body as verified through spectrography. This is significant in that hydrogen bonds are what hold DNA together. There are Quantum Mechanical models that describe subatomic particles such as Excitons, Plasmons, and Solitons that can store and carry biological information along macromolecules in response to low level scalar energy. To put it more simply, scalar energy is capable of imprinting itself on your DNA. The specific frequency signature information which the waves carry is the key to affecting great benefit. 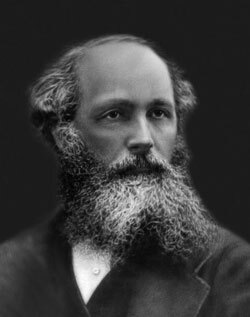 James Clerk Maxwell discovered Scalar Waves in the mid-1800’s. 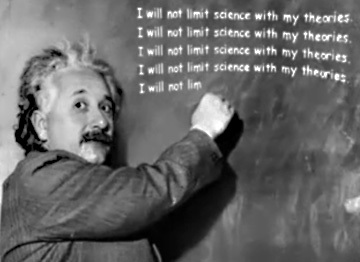 His work led to the development of quantum physics which Einstein used to explain Relativity and more. Nichola Tesla projected a Scalar Wave through the earth to a receiver on the other side with no loss of field strength. This did not sit well with the scientific establishment of that time. Tesla’s work however was acknowledged by the higher authorities who confiscated nearly all of his records and equipment upon his death. 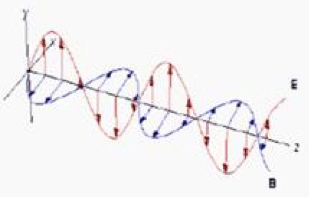 Here is an example of a hertzian wave form. All hertzian frequencies can be graphed as either a sine wave or a step wave which rotates in a counter clockwise corkscrew motion. This applies to everything from the electricity we use every day to magnetism and even to light and sound waves. Scalar Waves are unique unto themselves. They are created by a pair of identical waves, usually called the wave and its anti-wave but but 180 degrees out-of-phase. 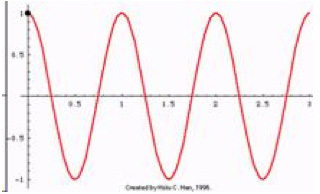 As one wave reaches its peak the corresponding wave is at the bottom in its trough. In this way Scalar Waves look very different from standard hertzian waves. They are referred to as self-contained three-dimensional waves that spin in a clockwise motion, a key difference from a hertzian wave. A Scalar Wave contains a vector code. This means it is able to hold memory information about its magnitude and its direction. The scientific community equates a Scalar Wave as an electromagnetic wave that works outside the realm of conventional 3rd dimensional physics because it can regenerate, repair itself indefinitely and it does not dissipate. Instead of running along wires or shooting out in beams as hertzian waveforms do, Scalar Waves fill its environment with specific information. This was a key factor in developing my products which can deliver specific scalar frequencies. Oddly enough, the shape of a Scalar Wave is very similar to the helical structure of DNA as it folds in and around itself. Our DNA also rotates in a clockwise motion similar to a Scalar Wave so they are in harmony, an important factor for our assimilation of the infused frequency signatures. “Within 24 hours of application, I received relief from the morning numbness in my fingers and hands which I have experienced upon awakening since 2012 installation of the smart meter on our property. Other attempts to offset the EMFs have had little impact — so I was thrilled to awaken “normally” the next day. Dr. Glen Rein, an internationally respected quantum biologist, has experimented with Scalar Waves extensively for a number of decades. His research uncovered how Scalar Waves positively influence immune and nervous systems independent of the beliefs of the individual taking part in the research. So even a non-believer can be affected by the benefits just by proximity to an infused device. I’ve included a few research papers written by Dr. Rein on the Frequency Research page. Kirlian photography is a specialized area of photography which can record the bioelectric field that surrounds all objects. It is popularly used to photograph the aura which surrounds our body. Below are two examples of objects before and after quantum Scalar Wave infusion. 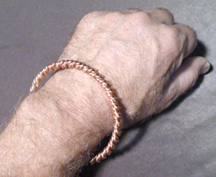 When a quantum imprinted device is placed on or worn around an arm, leg or worn close to your body you are receiving very specific frequency signature waves. As your blood travels along arteries surrounded by a Ring device the fluids in your body are being influenced by the Scalar Energies. When the device is removed, the influence remains in those cells which were exposed to the energy field. If you place an imprinted ring device on or around any consumable food or liquid the energy field frequencies will transfer to that consumable product and an alteration in its taste becomes apparent. This has been experienced by many through taste testing water where a slightly higher Ph level was imparted to the water after 24 hrs of ring exposure. I have personally conducted comparison tests with many individuals using side by side taste tests with “exposed” and “unexposed” bottled water. In every instance a noticeable improvement was noted with the “exposed” sample being “softer, slightly sweeter and less metallic/brackish”. On the Tensor Delivery page I have more information about how and where you can use these remarkable devices . Scalar Wave infusion imparts a unique frequency signature to solid objects placed in its field. The very same structures that allow the scalar charge to be embedded in an object also allow that charge to cross to the human body from the infused object. This is why I found Scalar Waves so interesting to explore, employ and integrate with tensor style rings. A standard tensor ring emits a field of energy based on its length of measure. Through my scalar infusion process I’m utilizing that field of energy to deliver frequency signatures which benefit our human condition. We recently crossed the threshold of the next frontier in our evolution. We are not only in the process of Shifting to the next Age but also gaining awareness of tools which can assist for a more meaningful and healthy transition.